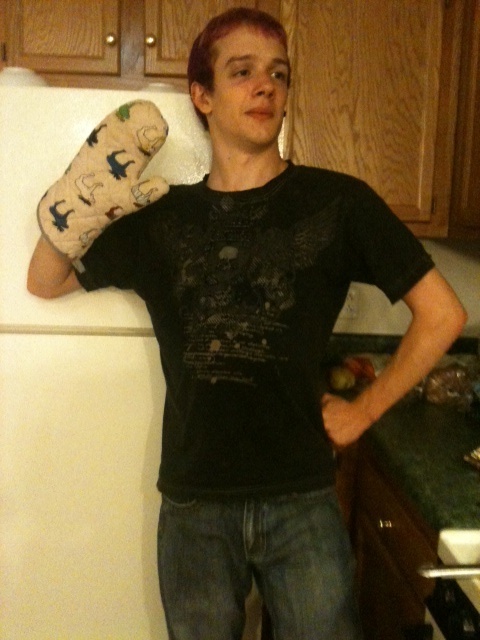 – Preheat oven to 350°F. Butter an 9-inch round cake pan (about 2 inches deep) and line bottom with a round of parchment paper or foil. – Whisk together cocoa powder, flour, cornstarch, and baking soda. – In a metal bowl whisk together whole eggs, yolk, sugar, and salt until combined. – Set mixture over a saucepan of simmering water and continue to whisk until lukewarm. 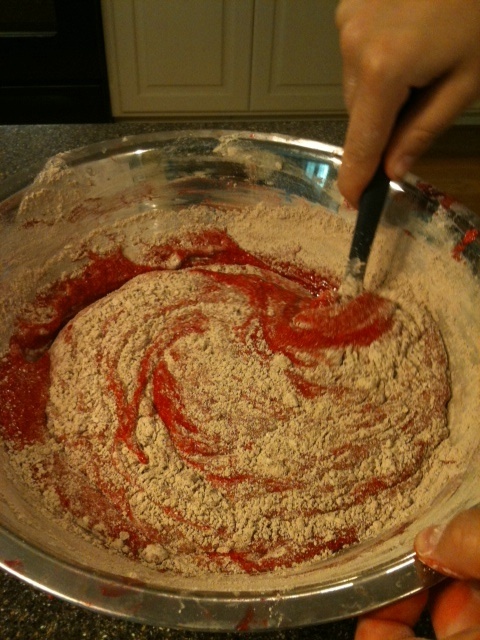 Remove bowl from heat and with an electric mixer beat mixture at high speed until it has cooled and doubled in volume. 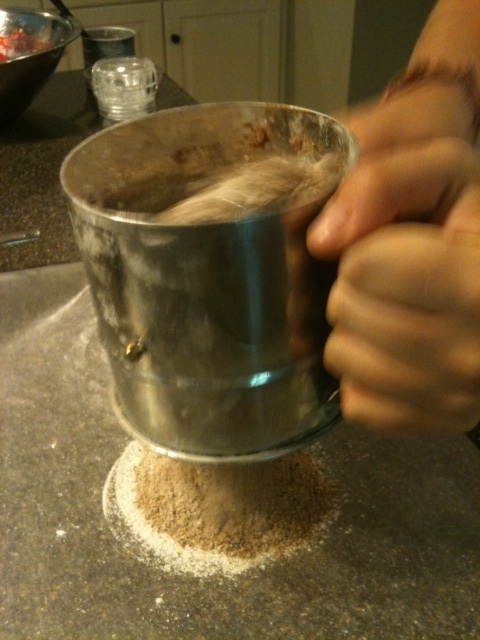 – Sift in cocoa mixture, half at a time until combined. 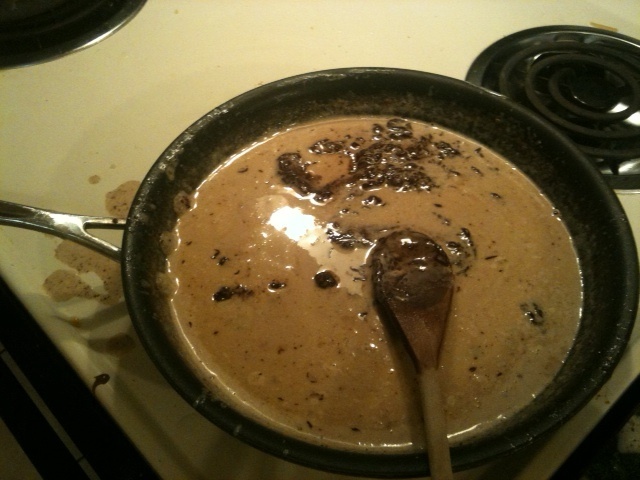 – Pour batter into pan and smooth top. 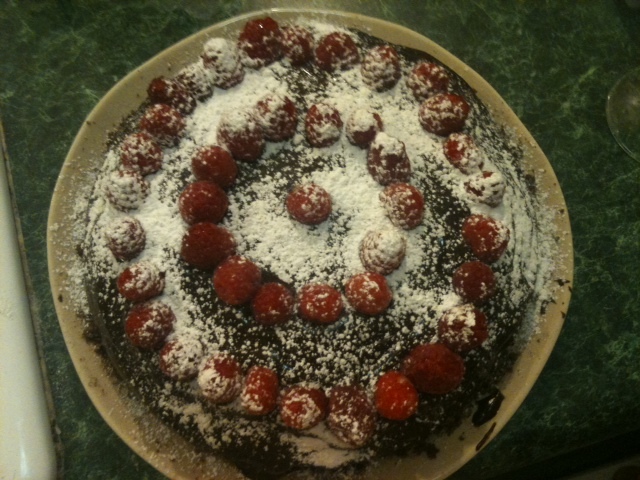 Bake cake in middle of oven for 30 minutes, or until it is firm to the touch and pulls away slightly from side of pan. Invert onto a rack and immediately invert onto another rack to cool right side up. In a small saucepan bring water and sugar to a boil over moderately low heat, stirring occasionally until sugar is dissolved. 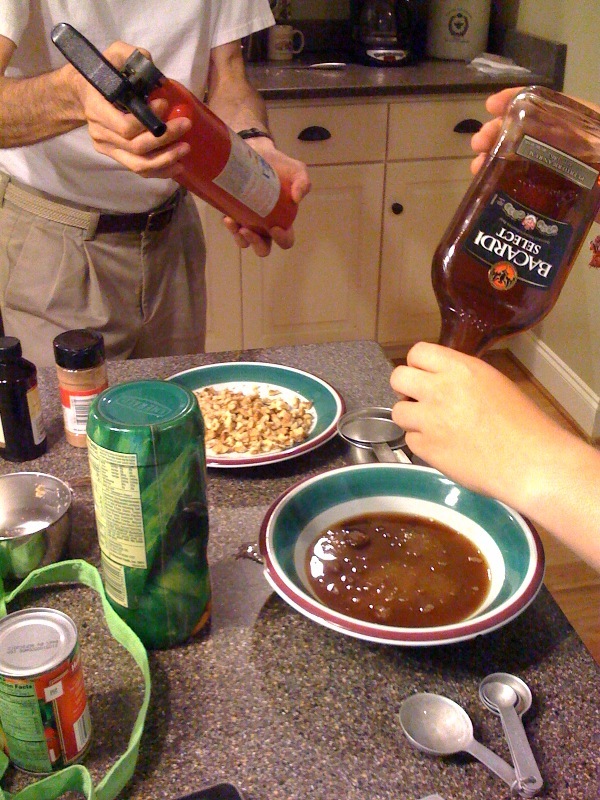 Cool syrup and stir in liqueur. In a saucepan bring cream, butter, and corn syrup to a boil over moderate heat and remove pan from heat. 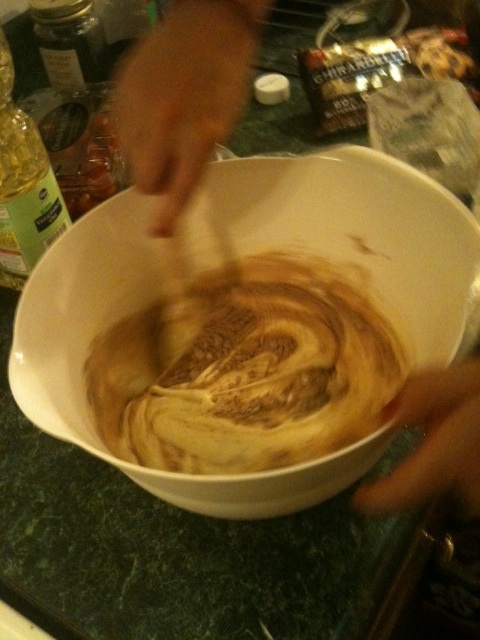 Add chocolate, swirling pan to submerge chocolate in hot mixture, and let stand 3 minutes. 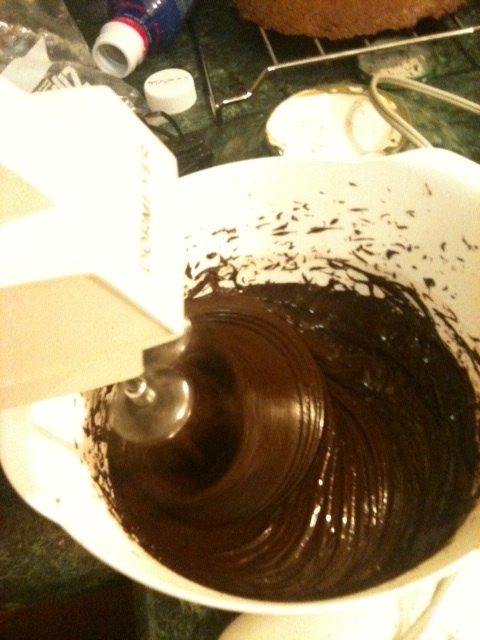 Whisk ganache until smooth and transfer to a bowl. Chill ganache, covered, at least 2 hours. – Let ganache stand at room temperature until slightly softened and pliable but still cool. With a whisk or electric mixer beat ganache just until light and fluffy. -Remove parchment paper from cake and with a long serrated knife cut cake horizontally into 2 or 3 pieces. -Spread a layer of raspberry jam and ganache in the middle of the two layers of cake. Assemble the cake and cover cake with the remaining ganache. Garnish with raspberries and some powdered sugar. Cool in the fridge until ready to serve. 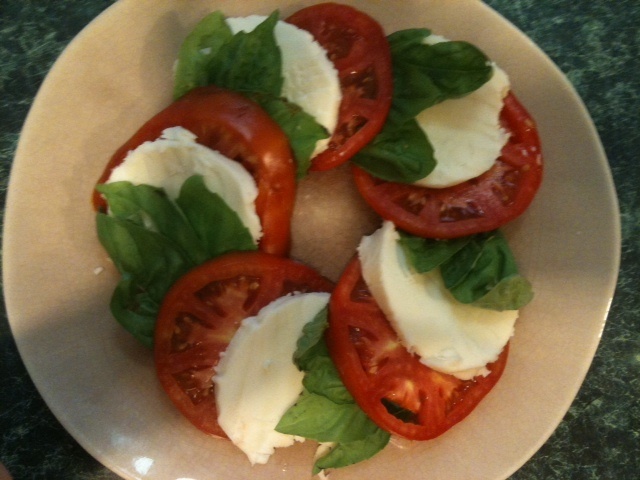 For those who have never had caprese – super simple salad but a surprising amount of people don’t make it! This delicious salad, commonly served in Italy even has the colors of the Italian flag! 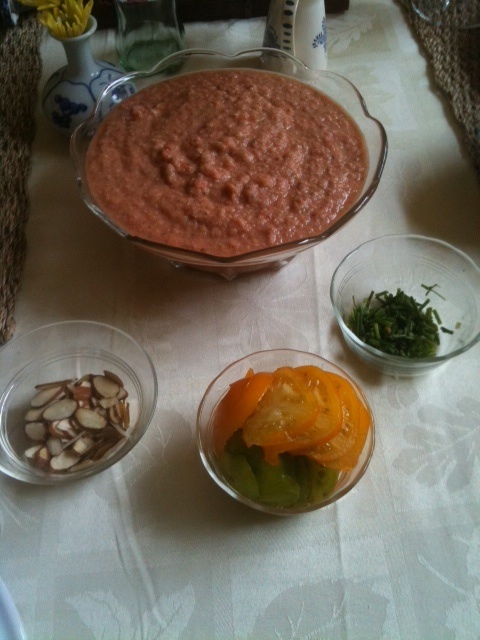 Array together beautifully and drizzle with vinegar. Done. Cook fetuccine or whatever pasta your little heart desires until al dente. Meanwhile, sautee olive oil, garlic and onion until it all smells good. 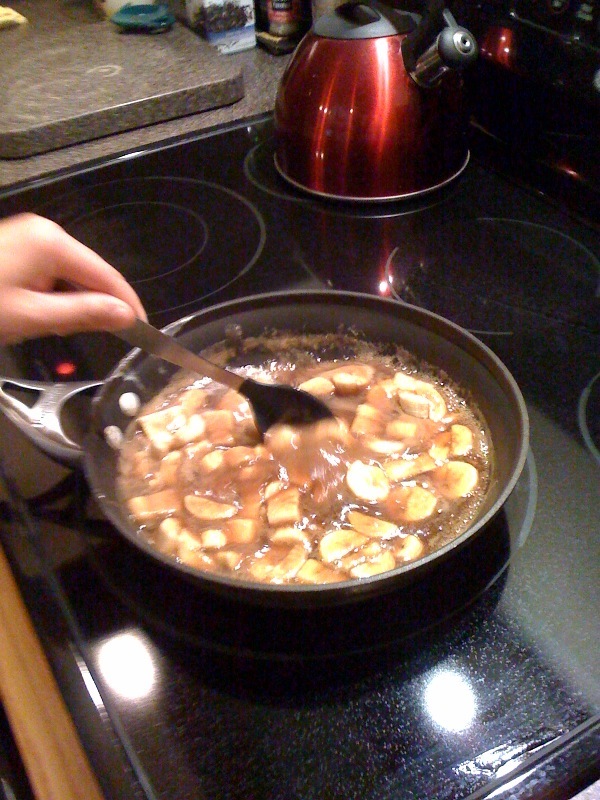 Cube and cook the chicken breast in a separate pan. 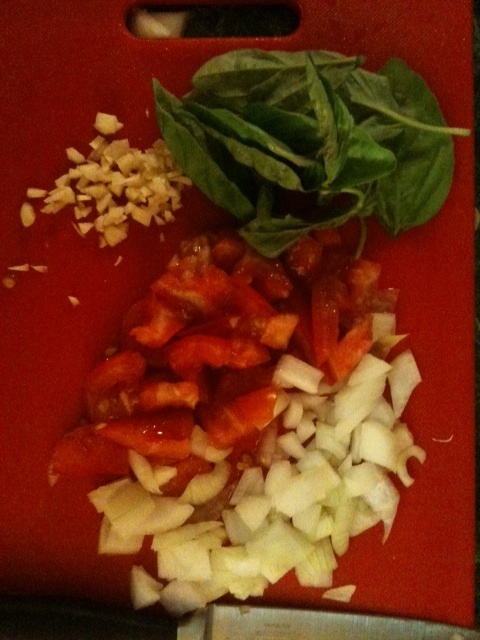 Add cooked chicken, basil, tomatoes, salt and cover. Reduce heat to medium and cover. Stir frequently until tomatoes are soft. Serve immediately over pasta with some fresh parmesan on top! -At medium speed, beat in oil and lemon zest and juice until just combined. 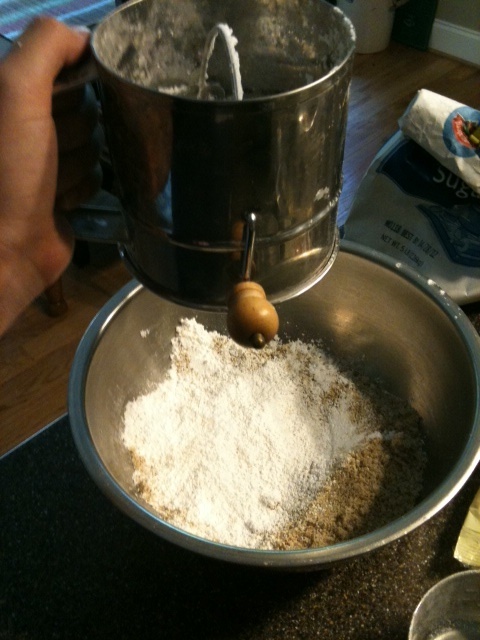 – Sift in flour and mix at low speed until just combined. 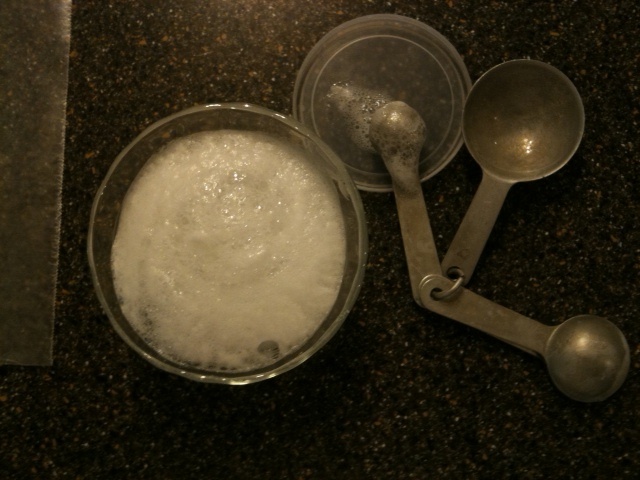 – In a separate bowl, beat whites with salt in another large bowl with cleaned beaters at medium-high speed until foamy, then add remaining 1/4 cup sugar a little at a time, beating, and continue to beat until whites just hold soft peaks. 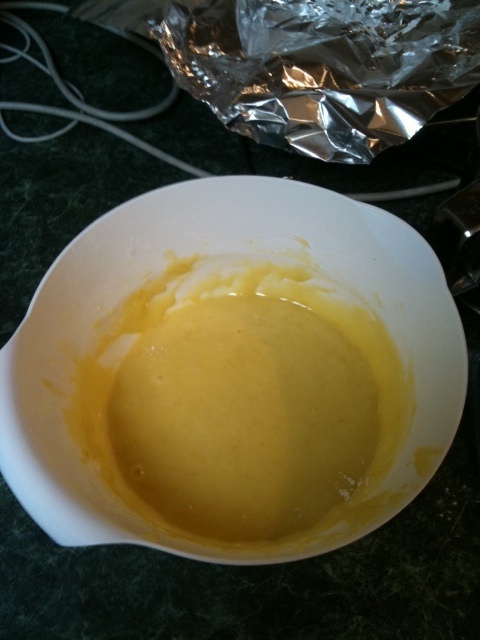 -Gently fold one third of whites into yolk mixture to lighten, then fold in remaining whites gently but thoroughly. 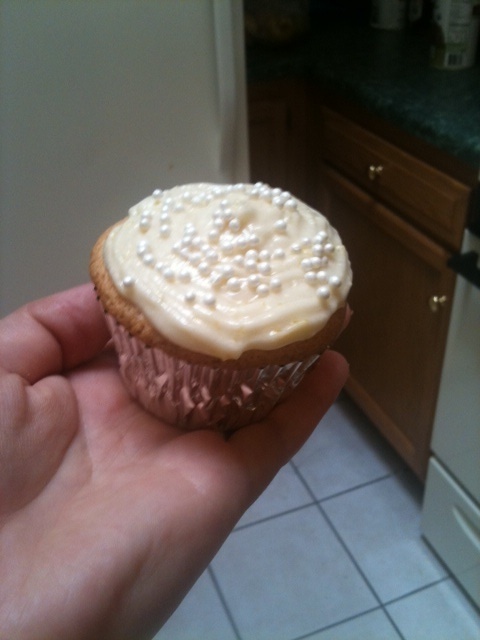 – Transfer to lined cupcake pan and bake until golden brown or until a toothpick comes out smoothly – about 17-20 minutes. – Cool in pan on a rack 10 minutes, then cool cupcakes to room temperature, about 1 hour. – you may want to blend this in portions. 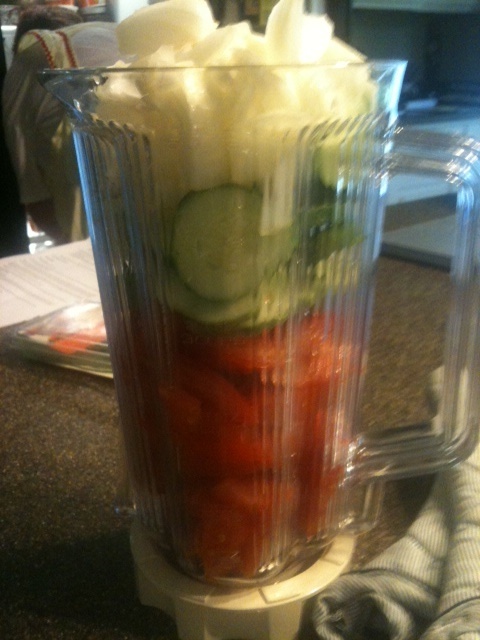 A pound of tomatoes is a lot for a itty bitty blender. Unless you have the jumbo ones that can demolish anything. I served this with a grilled chicken for a lunch – super simple, yummy. For a little extra flair, put some chopped chives, almonds and fresh green tomatoes on top as garnish. Heat a pan and melt butter. 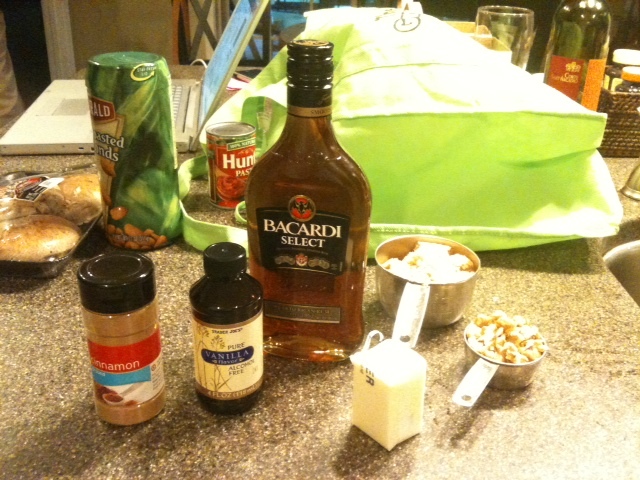 Stir in sugar, rum, vanilla and cinnamon. When mixture begins to bubble, place bananas and walnuts in pan. The rum may ignite spontaneously so don’t freak out. Also, if it does not, take a long match to it and light it yourself! That is if you’re a pyro or just want some good fun. Make sure to watch your eyebrows! Cook until bananas are hot, 1 to 2 minutes. 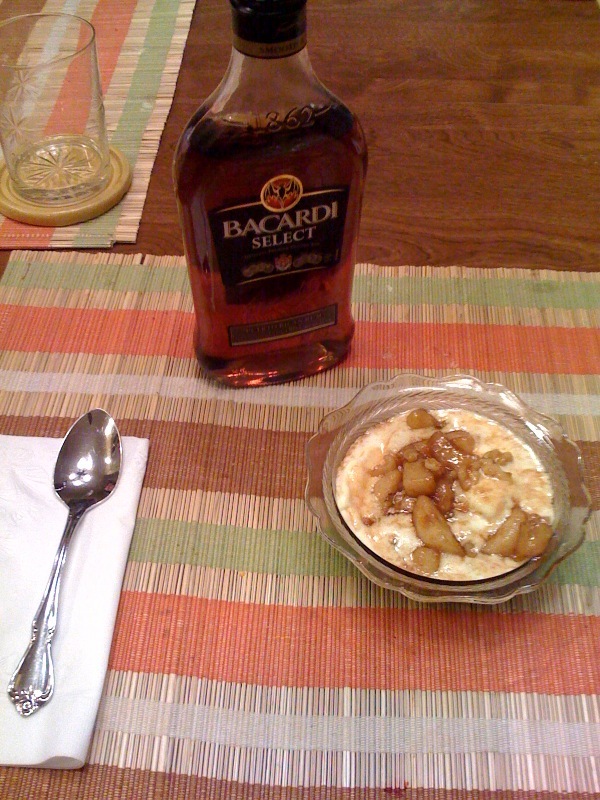 Serve at once over vanilla ice cream. – Preheat oven to 350 degrees and grease muffin pans or line with 20 paper baking cups. – Put the baking soda and vinegar in a small bowl and let it react. Then add to the mixture. – In a seperate bowl, combine the flour, cocoa powder and salt and sift. This makes the cupcakes extra smooth and yummy. Not necessary to sift but worth it! Also, if you want to, substitute gluten free flour for those who are dietarially challenged! 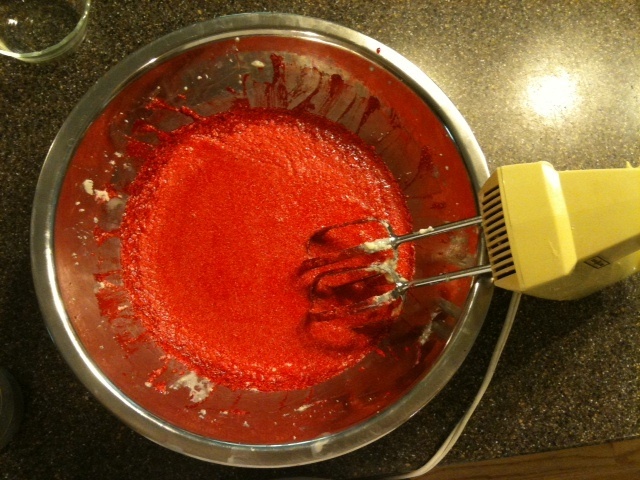 – Stir into the batter just until blended. 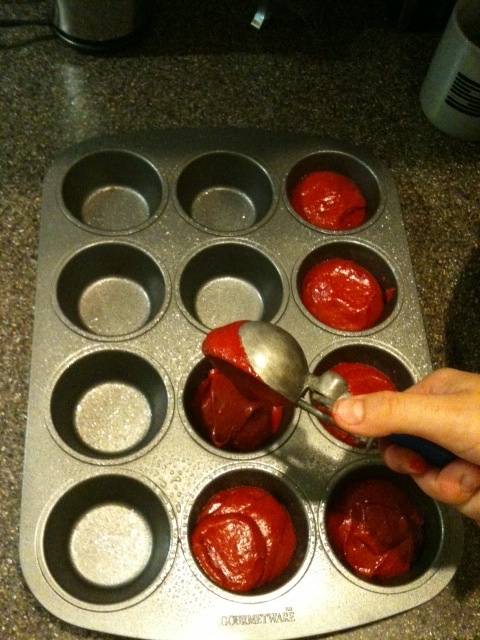 – Put in cupcake pans with an ice cream scoop – this gives you the correct amount. 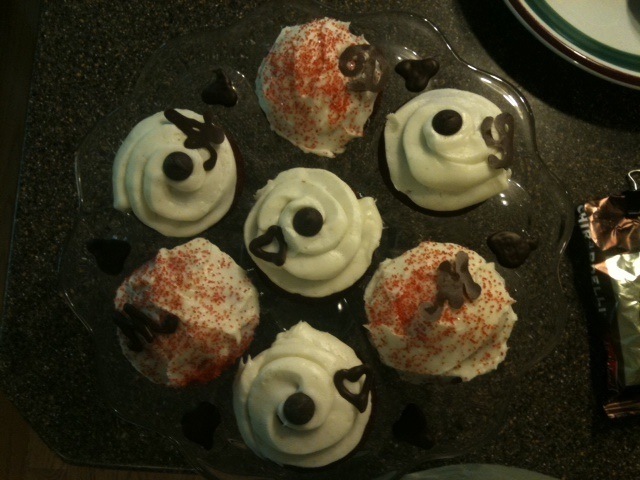 The recipe I used said to fill the tray 2/3rds but I like extra full cupcakes so I put an extra dollop on top. – Bake 20-25 minutes, make sure when you take them out that you can insert a toothpick and take it out without any sticking. – Cool pan, don’t frost until they’re all the way cool or it will melt! Suggestions: bake only 20 minutes so it’s not too crusted and make sure to put in airtight container immediately so they don’t get stale. 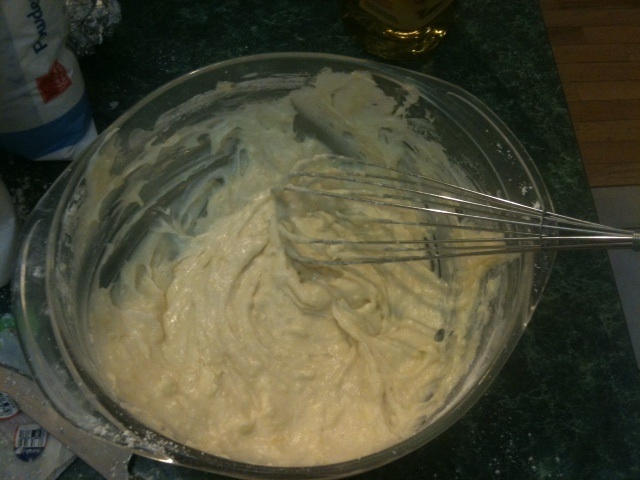 For Icing: Blend softened cream cheese, butter, sour cream and vanilla extract until light and fluffy. Beat in the confectioner’s sugar gradually. 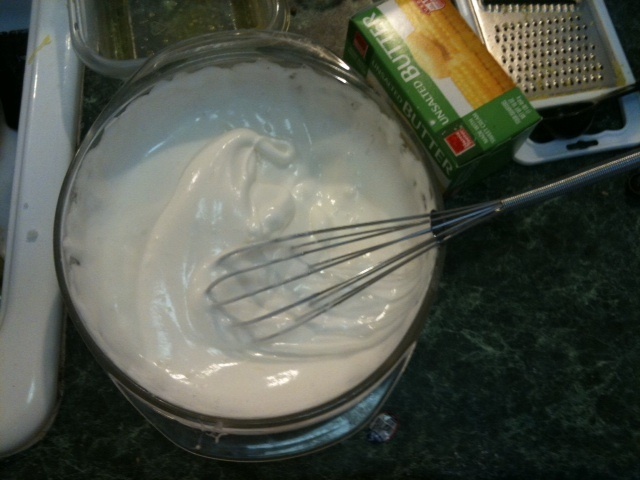 You will have a thick and yummy cream cheese icing!! 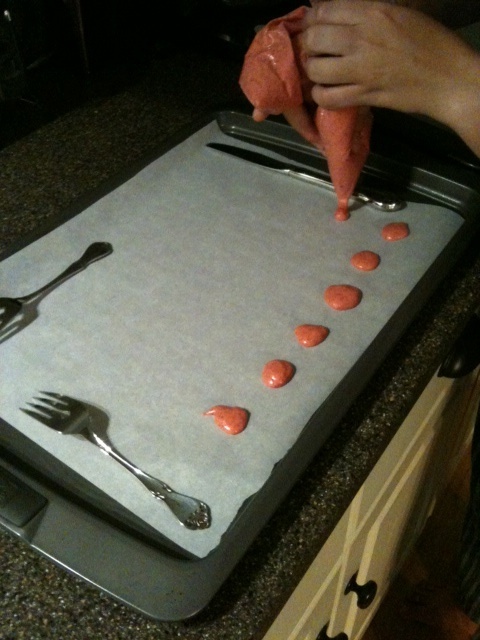 You can put it in a zipblock bag and cut off the end to help apply the icing or just put it on with a knife. 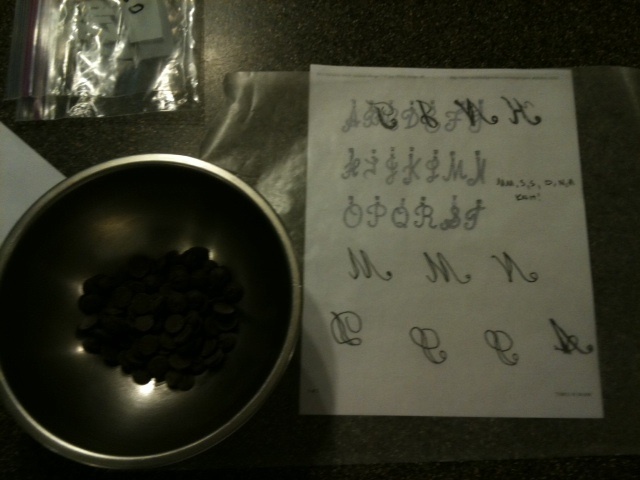 Monogrammed chocolates – print out a large image of script alphabet, and turn it upside down. 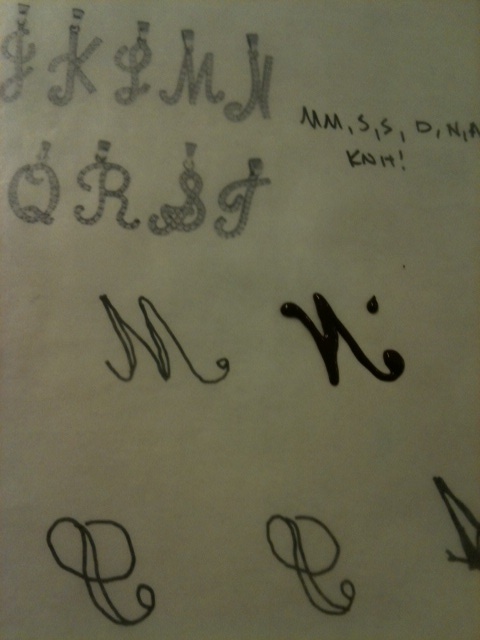 Trace what you want to write on another piece of paper and put it underneath your wax paper. Then, heat up a handful of Ghiradelli chocolate in a bowl sitting in a pot of simmering water (try to not let the bowl touch the water). Stir until melted. Put it in a zipblock bag and cut the teeniest tiniest corner off of it. Trace your backwards letters on your wax paper and put in fridge. You might want to trace a few or make some thicker just in case they brake when you take them off the paper. 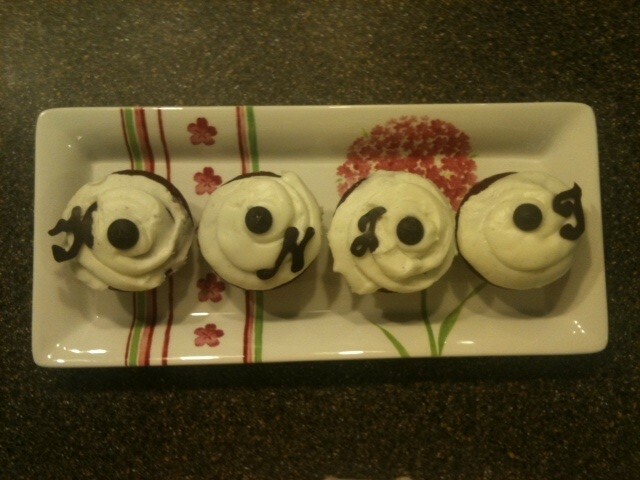 Make sure to flip them around when they’ve cooled and put on top of the cupcakes for extreme cuteness! Yum. Add some sprinkles or chocolates for extra flair. Orrr if you’re having some gals over to knit…. – coat your pans with parchment paper. Wax paper will also work for the starving college students like me. – Combine almonds with 1/2 cup confectioners sugar in a processor until very finely ground. Sift in remaining cup of confectioners sugar and stir. 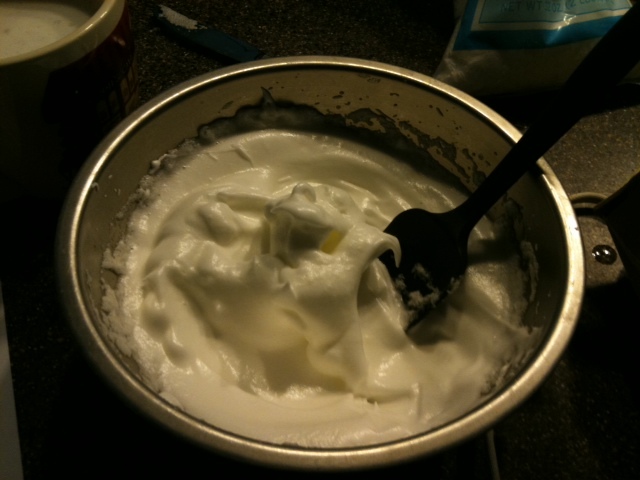 – beat egg whites with salt in another bowl with an electric mixer (medium speed ish) until they just hold soft peaks. 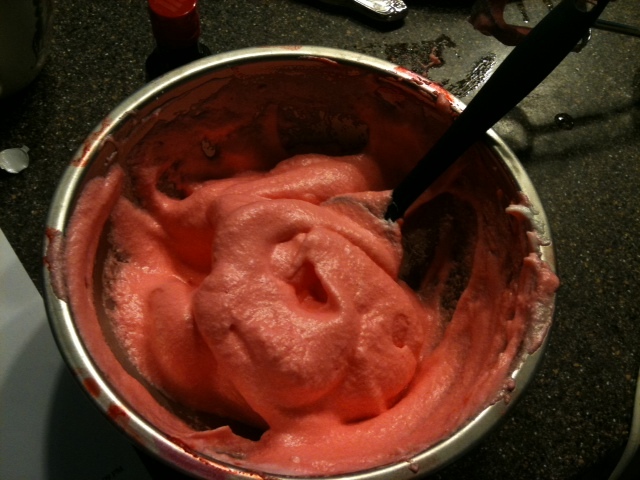 – add granulated sugar slowly while increasing to high speed until you get stiff, glossy peaks. – the edges should be slightly darker and crispy but not burnt! 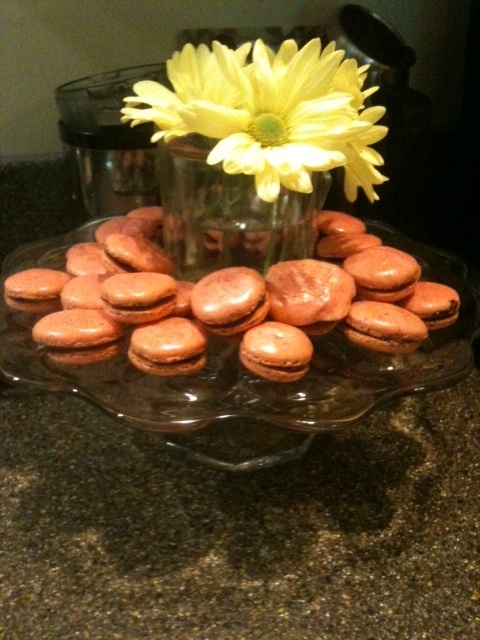 -put a dollop of the ganache in between two similar sized cookies. If you don’t have a steady hand like myself, then you will have fun pairing different sized cookies! 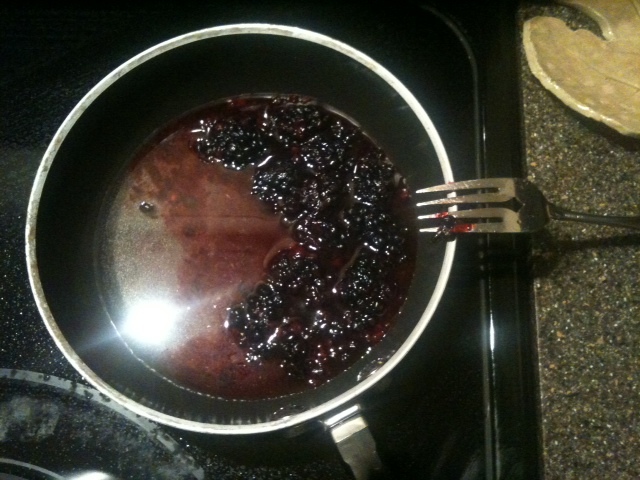 – also as an alternative, heat some fresh blackberries in a pan with about a cm of water and cook real slow for ~30 minutes. Add some blackberry liqueur and that makes a tasty alternative if you don’t like chocolate or just want variety! 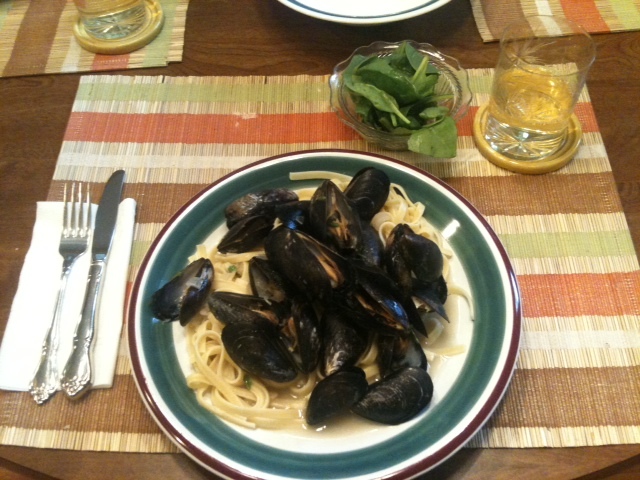 If your mussels haven’t been cleaned yet, do so. Just take a knife and scrape off all the beards. Make sure water is boiling for pasta and put it in. Use gluten free pasta if desired. In a separate, deep pan or pot, put shallots, garlic, wine and salt over medium heat for 5 minutes. 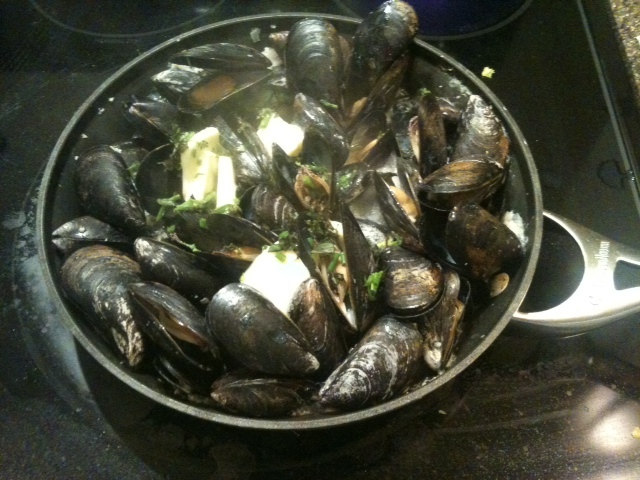 Then put mussels in for 5 minutes, turn on high, and cover. Make sure it doesn’t boil over (it has a tendency to get hot really fast!). 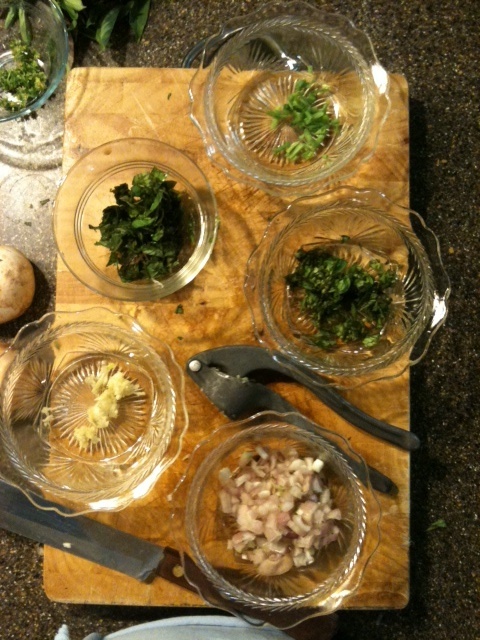 After 5 minutes, or a little more if all the mussels haven’t opened yet, take of the lid and put in butter and chopped herbs. Throw away any mussels that still have not opened. 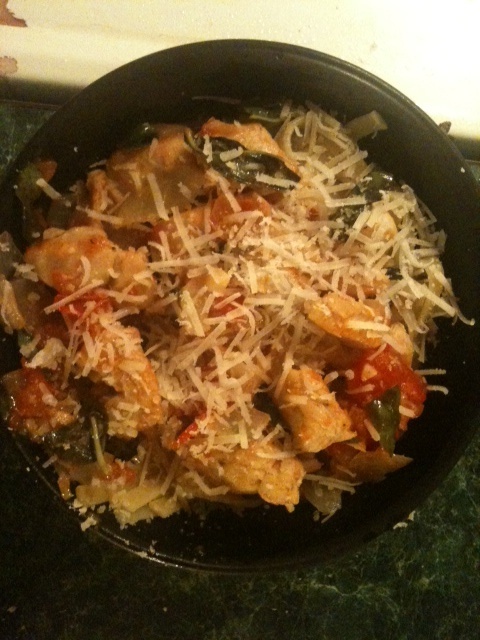 I prefer a little more basil to top it off, but put whichever herbs satisfy your taste buds! Mix together until butter is melted and serve over pasta. 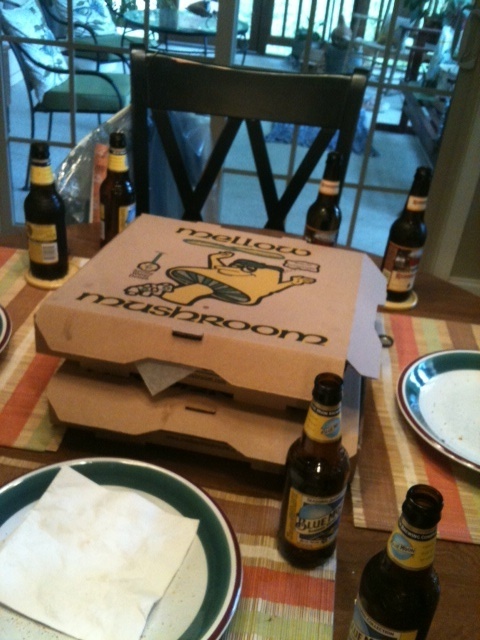 Delish and super inexpensive!